Add a Product content block to your email to quickly promote best-selling products or special offers. Drag and drop the block into your layout, and choose the products you want to share with your contacts. After you send, check out revenue results in Reports. In this article, you'll learn how to use the Product content block. Product content blocks are available to users who connect a supported e-commerce store or custom API 3.0 integration. To find out if your store supports this feature, visit the Connected Sites page, click the name of your integration, and check the Features list. To track purchases from a campaign, turn on e-commerce link tracking. For best results, you should only promote products from the store that's connected to the list that will receive your campaign. After you connect your store with Mailchimp, we'll push e-commerce data to your account so you can promote products. Include up to four top-selling or manually selected products to any Product content block, and any number of Product content blocks in your campaign. Each block can contain any combination of the following: product name, custom description, price, and call-to-action button. Product images are pulled directly from your store, and can sometimes be too large or too small for your campaign template. Images work best when sized to maximum width of 600 pixels. To insert a Product content block, follow these steps. 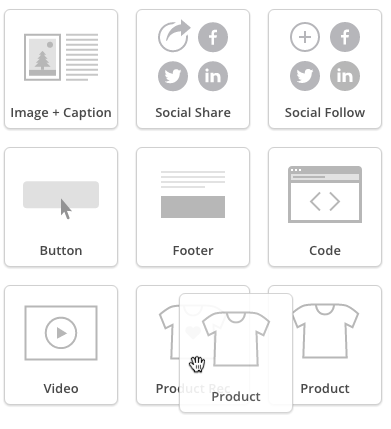 On the Design step, click and drag the Product content block into your campaign layout. In the Content tab of the editing pane, click the drop-down menu to choose a store. If you only have one store connected to your Mailchimp account, we’ll preselect it for you. We recommend you choose a store that’s connected to the list that will receive your campaign. Click one of two options. Use Top Sellers: Include up to four of your store's top selling products. Browse All: Choose specific products from your store. 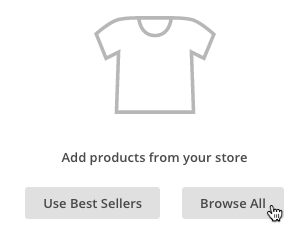 If you choose Browse All, a Select a product pop-up modal will appear. Click the Product drop-down menu to choose from the first 10 products in your store. Or, type a product name in the search bar to expand your search. After you choose a product, click Insert. Click the Add icon to include up to four products. Click Change if you need to replace a product. In the Product Details section, you can edit the information we display about each product. In the Title field, change or remove the title shown for a product. In the Price field, change or remove the price shown for a product. Toggle the Custom description slider to the green checkmark to input additional product details. Toggle the Button slider to the green checkmark to include a call-to-action button. To provide a direct route for customers to make purchases, customize the call-to-action buttons in a campaign. 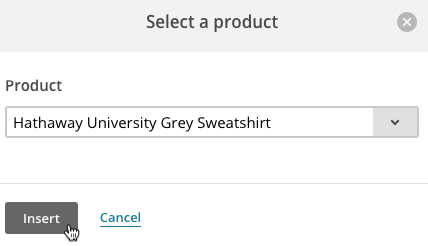 By default, a button links to the item's product page in your store. To include and configure a button in your Product content block, follow these steps. On the Design step, click the Product content block you want to work with. Toggle the Button slider to the green checkmark. Type the label for your button in the Button Text field. If you change the price of a product in your campaign, we'll only change it in Mailchimp. Be sure to also update the item's price on the product page in your store. After you insert your Product content block and edit your product details, You can brand the design of your content block to match your store. To style your Product content block, follow these steps. 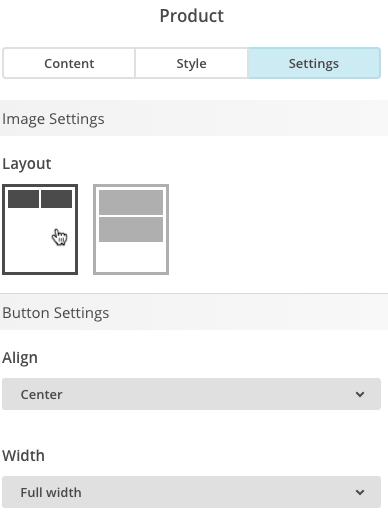 In the Settings tab, choose the layout of your product images, as well as the width and alignment of the buttons in the block. 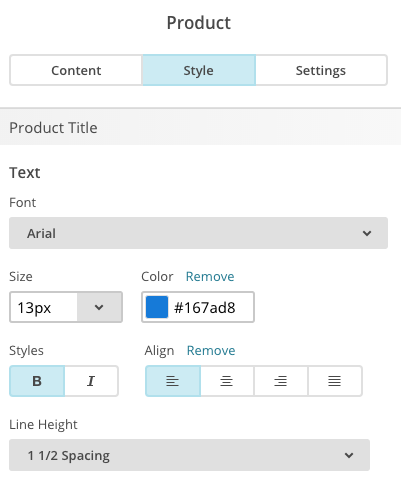 In the Style tab, set your font and button styles, text alignment, and spacing. Check the box next to Apply to all existing Product blocks to apply the settings to any other Product content blocks in your campaign. After you send a campaign with e-commerce link tracking enabled, you'll be able to view purchase data in a couple different areas in your account. In the Reports section of your account you'll see the following purchase information for each campaign you send. You can view purchase activity in the Activity Feed on each contact's profile page. The profile will display the total orders received and total revenue amount for the contact. If the purchase was tied to a Mailchimp campaign, we'll also display the name of the campaign. Boost revenue in your connected online store with Product Recommendations. Learn how to automatically display unique product recommendations in your emails.